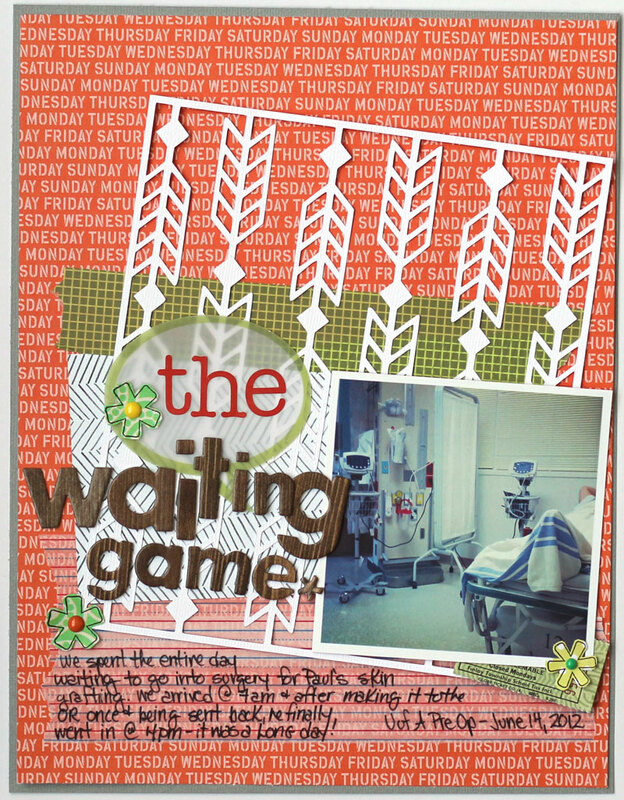 LifeInProgress: And then there was "the waiting game"
And then there was "the waiting game"
Wait..what's this? A layout? And a post? Two in two days? Yeah, I'm on a roll! This won't be long though - we kind of overslept (like until 1:30 pm - hey! I worked late last night!) so it's been a crazy kind of afternoon what with trying to wake up, function, and do the normal afternoon type things. Apparently the dogs got fed twice (which makes up for yesterday morning when they didn't get fed at all....). So now I'm off to get ready for work! I've got more layouts up my sleeves, but I'm pretty happy with this one right now. Paul said he's "tired of layouts about [him]. But it's better then the time you kept making all your layouts about the dogs". Hmpft. Boys. Have a lovely day! The sun finally came out here! Yeah! I LOVE THIS LAYOUT! Ever since seeing that die cut on Studio Calico's blog, I have been thinking of making my own stamp or stencil in that pattern! I even almost clicked the dreaded "purchase" button on their website the other day....almost! Boys indeed! I don't show Russel any of my layouts anymore, because he asked too many silly questions or pointed out "mistakes"....BAH! Gorgeous layout, I love how you used the cut file-swoon.